I was rushing to the ladies’ room before the funeral service began when she reached out across the wooden, church pew and grabbed my arm. Sitting alone on the back row, this beautiful lady smiled up at me with sparkling, blue eyes. With the graceful aim of a master fisherman casting her line, she lured me closer as she spoke. Pausing to process this stranger’s request as she held firmly to my arm and patted my hand, I listened closely as she continued. The tender, urgent request melted my heart. As I patted the top of her weathered, gorgeous hand, I gave her my promise to offer rest and respite. Two sisters, faithful to Jesus and fiercely loyal to each other had weathered life’s storms together, and today was the day when one sister would say an earthly goodbye to the other. For years and right to the end, she’d stood beside her sick sister without complaint caring, sacrificing, and serving. I was praying for my loved one’s comfort and loneliness, but after receiving the stranger’s request, it dawned on me that she was far from alone. My loved one was surrounded by her sisters in Jesus. Several of them stopped me and made the same earnest plea as the stranger on the back row. Looking around the church, it was clear they had all gathered not only to say goodbye to one, but also to announce, “We are still here” to the other. They were gathered in hugs and linked arms. They gathered with casseroles and labors of love from their kitchens. No one had given them instructions to gather or told them what to bring. They just showed up. The love between these women is real and it’s strong because the foundation is a love for Jesus. An army of women gathered at church on the day of goodbyes, but it was not the first day they’d shown up together. They’ve gathered at the Lord’s House regularly to worship and serve. This beautiful display of loving Jesus and each other reminds me yet again of God’s exquisite plan and provision. He has been gathering since creation. In Genesis 1:9, God gathered the waters. In Exodus 16, the Israelites gathered God’s provision in the desert. In Matthew 19:13-14, wherever Jesus was the little children gathered. In Matthew 26, Jesus gathered His twelve disciples for Passover before His death. When He comes back again, which He will do, He will gather His Children. Gathered together we can’t be pulled apart. There in His House, gathered to serve Jesus, a supernatural knitting of hearts happens. The Master Creator pierces the fabric of our lives and draws a thread of Christ’s love connecting and stitching us together. In His glorious design, the cord of Christ pulls us closer and ruffles appear as the fabric is gathered. Pulled tightly against each other, the splendor of Jesus flows and moves merging us in unison displaying God’s glory. The intricate motion of loving Jesus and each other rolls rhythmically like ocean waves. We need to gather because every one of us will face days when the fabric of our lives is ripped to shreds. When those days come, we need each other. 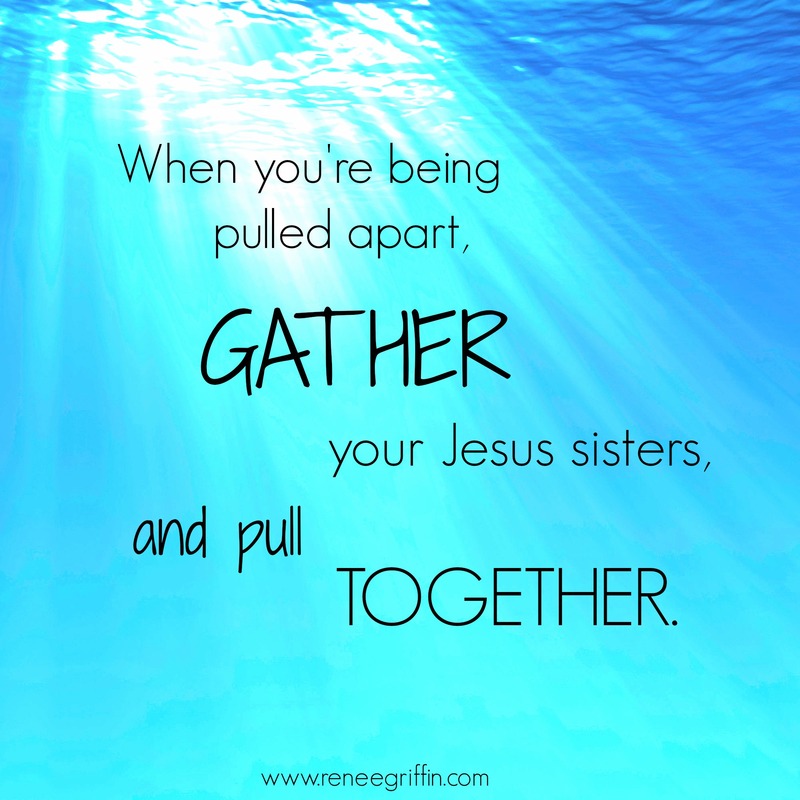 When you’re being pulled apart, gather your Jesus sisters and pull together. Can you round-up a third? Do you know who your Jesus sisters are? If so, thank God for them. 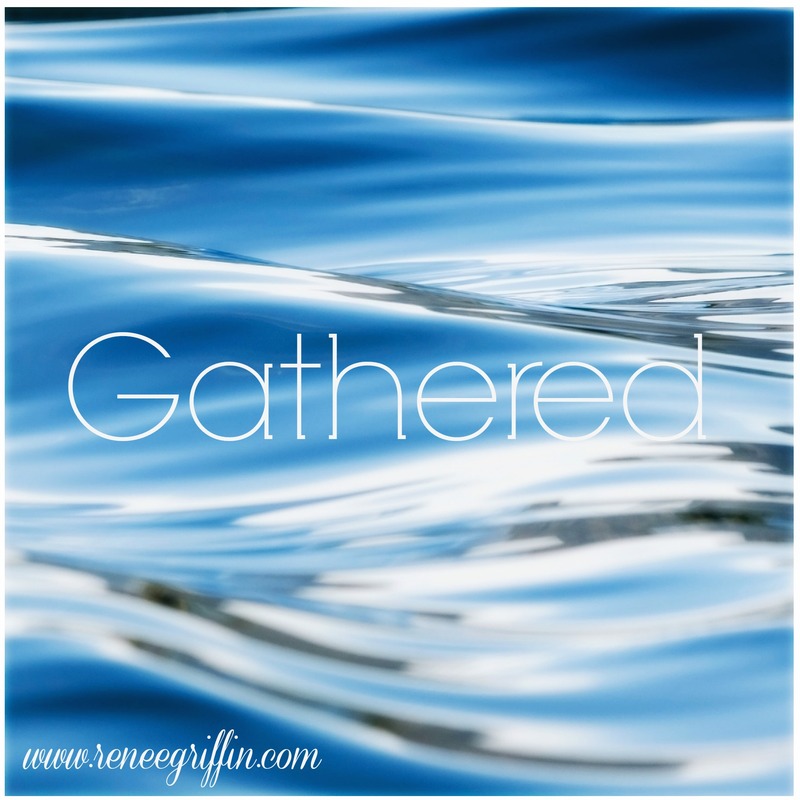 Have you lost touch with your Jesus sisters when you stopped gathering at His House? Come back. Don’t have any? This Sunday, go to church. I promise you, they are gathered there. Isn’t the Body beautiful?! A Gathered study would be awesome – you’ve got me ready to pull up Strong’s! What a great idea!!! Thanks for inspiring me to keep on digging. Love God’s Word! Blessings, friend. Stopping by from #RaRaLinkup and #LifeGivingLinkup. This is a beautiful post! Thank you for sharing your heart. Happy to connect, Stacey! Thanks for stopping over. So true! We need each other. We sure do, Elizabeth. Thanks for taking the time to comment. We need each other’s encouragement. Have a beautiful day. You have such a gift of speaking words that go straight to my heart. Thank you for blessing me with your gift of encouragement, Suzie. Hugs! Renee…. this. is. beautiful. This work of art flowed like a sweet piece of poetry. And, how incredible the Body of Christ! Thank you for this! What a kind comment, Crystal! Truly, truly thank you! God continues to amaze me with voices of sisters who bless me. Thanks for being a sister in Christ to me today. God’s gift of spiritual sisters is a true blessing. Thank you for this post. Oh, Libby, I totally agree. Isn’t it wonderful to add digital spiritual sisters,too? Thanks for your sweet comment. Sisters are such a gift. Thanks for coming by and leaving a comment. I really appreciate all the responses from my sisters. I so thankful, too, Kim. Together we are better. Much love to you today in Jesus. (Matthew 18:20 NLV- For where two or three are gathered together in MY name, there I AM with them.) Thank YOU, JESUS! Renee, thank you for this precious reminder of what it truly means to be sisters in CHRIST! Infinite blessings to you, Love! So thankful He is with us. Thankful for your continued encouragement, Tai. May He fill your day with His amazing grace. I so loved this Renee! I am thankful for my Jesus sisters! And so blessed by them!